Charlotte Markham has been a victim of Fate. She lost her husband to a fire and was forced to take a job as governess in the Darrow house. When Nanny Prum is brutally murdered in the middle of the night, Charlote is required to take on those duties as well. She shares one thing with her charges — they’ve both lost someone dear all too soon. Their mother died recently and the children, understandably are still not themselves. In an attempt to help them decompress, she invites them to draw something from their dreams. Paul, the elder brother, creates a detailed map of the grounds, with one important difference — a house where his mother waits for them. The book is somewhat reminiscent of The Turn of the Screw. The narrator is a very conscientious, if sometimes naive, guardian of the children. With her, their health and happiness is paramount. At the same time, she is also precocious and is determined to satisfy her curiosity. Despite her in-the-moment mentality, there is much she still has to learn. The “rules” of the House of Darkling are unknown, as are the opponents. Her own memories haunt her just as she tries to relieve the strain on the children. But something she cannot resist lies just beyond the misty orchard. 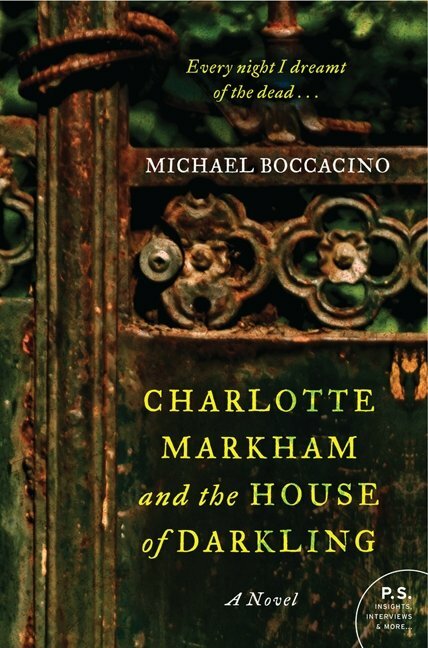 Charlotte Markham poses philosophical questions about life and death, and how we would the choices given to her. It’s also a dark tale of literary adventure where a spunky young woman tries to outsmart Death. I didn’t find it to be life-altering, but it is a very enjoyable read. It is well-crafted storytelling. The “rules” are a bit convoluted and it feels somewhat rushed near the end, but it hardly matters. The imagery and atmosphere are dark and rich. Many thanks to the kind folks at William Morrow for the review copy. I had a tough go with this book, weirdly enough — I adored the ambiance and world-building but just couldn’t stand Charlotte. I somehow missed that this was more fantasy than historical, pastiche rather than straight up hist fic and so I really just couldn’t get into the book. Alas. I’m looking forward to Boccacino’s next book though — his writing was very good. I agree that sometime Charlotte was frustrating, but I hope that it was intended to show an immature young woman rather than a weak character. At least that was how I took it. I found the fantasy element quite surprising! I thought I was reading another Gothic-style novel (which I love) and then it was suddenly “A Wrinkle In Time” or a Twilight Zone story. And I agree that Boccacino’s writing is quite good. He is great with atmosphere, especially. Great review! I’m really loving that picture of the misty Orchard.